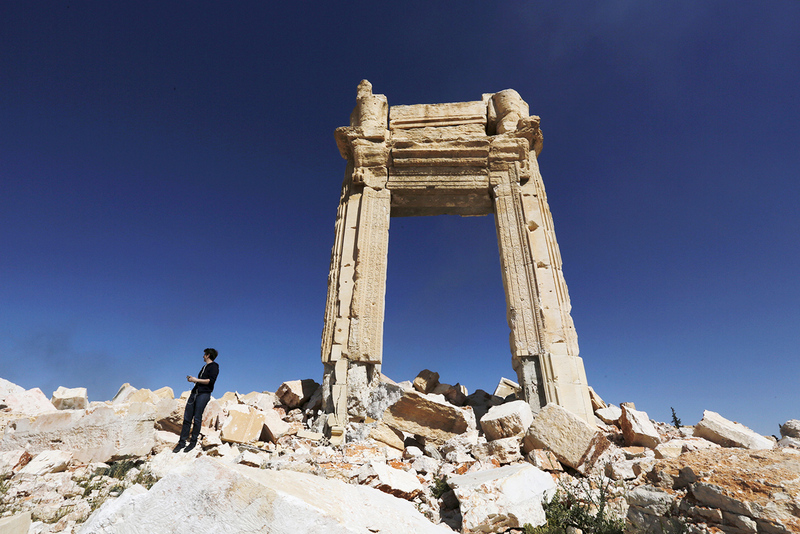 A journalist stands at the remains of the Temple of Bel in the historic city of Palmyra, Syria. Images taken from space show historical sites in Palmyra that were blown up by ISIS terrorists over the past month. Alexander Lesovoy, an expert who previously visited Palmyra to assess the destruction caused by the first wave of terrorist attacks, has commented on damage to those sites that were still intact in the autumn. After retaking Palmyra in December 2016, members of the Islamic State (ISIS) resumed destruction of the city’s remaining historical and architectural treasures. The scale of the damage is visible from satellite photographs published on UNESCO’s website. The tetrapylon and the Roman theatre’s proscenium - the part of the stage closest to the audience - have now been destroyed. Only four of the 16 columns of the tetrapylon remain standing, and the theater’s facade has been reduced to a pile of rubble. Tetrapylons are right-angled buildings formed with four entrances - one on each side. They were built at important road intersections as aesthetically pleasing architecture or as a sub-type of triumphal arch erected to honor victors or to commemorate important events. This type of structure was also associated with the cult of Janus, the god of doorways, entrances and exits. The obliterated tetrapylon was built around 270 AD when Palmyra was ruled by Queen Septimia Zenobia. The theater, originally built around the 2nd century AD, was cleared and reconstructed in the 1950s. It was erected in the middle of a public square bounded by a semicircular colonnade that stretches to the southern gate of Palmyra. In recent decades the theater served as the venue for the annual Palmyra Festival. It was here in May 2016, after the city’s liberation by the joint military forces of Syria and Russia, that a concert was given by the Mariinsky Theater Symphony Orchestra under the baton of Valery Gergiev. The concert was titled, “Prayer for Palmyra. Music revives the ancient walls,” and these words became a rallying call. The theater was also the place where a year earlier ISIS made a video of its execution of 25 prisoners. Alexander Lesovoy, general director of the Grabar Art Conservation Centre in Moscow, told Gazeta.ru about the significance of the destroyed cultural property. Last summer he visited Palmyra as part of a Russian delegation to assess the damage incurred during the first occupation by the terrorists. “The destroyed tetrapylon has four structures in the form of pavilions that were at the intersection of the main streets. Its purpose was to display the city’s grandeur and emphasize its layout. Last summer, this site was fully intact and undamaged. “The second site is the amphitheater, which was also perfectly intact, since ISIS staged executions there. Now its central part has been destroyed. Behind the amphitheater was a finely decorated retaining wall that had eight or 10 arched spaces and also a central area with a portico. “The concert by Russian musicians took place below in the actual amphitheater. In ancient times dignitaries and important individuals sat beside the columns admiring the theatrical performances. All this was intact last summer.